Diversity of Plant Knowledge as an Adaptive Asset: A Case Study with Standing Rock Elders. Indigenous knowledge is often represented as being homogeneous within cultural groups, and differences in knowledge within communities are interpreted as a lack of cultural consensus. Alternatively, differences in knowledge represent a range of possibilities for communities to respond to social and ecological change. This paper examines the diversity of plant knowledge among elders who live in the Standing Rock Nation of the northern Great Plains. Elders know how to use different plants, and also hold different knowledge about the same plants. 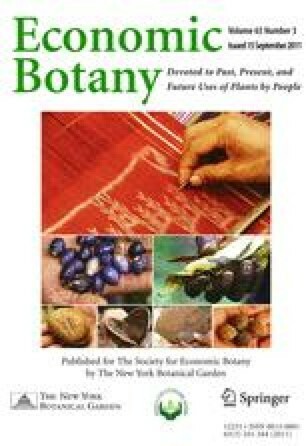 Analysis indicates that elders each contribute unique, complementary, and seemingly contradictory plant knowledge to their community. Compiled seasonal rounds help visualize differences in knowledge about the temporal availability of plants. These differences are linked to variations in use, including references to specific gathering sites, strategies to harvest multiple species, and selection of plants at different stages of development. Elders’ diverse knowledge about the seasonal availability of plants may facilitate community adaptation to climate change in the 21st century. The authors would like to thank the director of NFE, Luella Harrison, for her guidance throughout the research process. We are indebted to the Standing Rock Elder Advisory Council for their enthusiasm and support. Thanks to all of the elders who shared their knowledge, including Therese Martin, Leonard Village Center, Stella Whitesell Guggolz, Theo Iron Cloud, and those named earlier in the text. We would also like to thank Timothy Fahey, Kurt Jordan, Stephen Morreale, the editors, and the anonymous reviewers for valuable insights that strengthened this work. This material is based upon work supported by the National Science Foundation Graduate Research Fellowship under Grant No. DGE-0707428. CDC [Center for Disease Control and Prevention]. 2007. National diabetes surveillance system. http://www.cdc.gov/diabetes/statistics/index.htm (6 April 2010). IPNI. 2011. The International Plant Names Index. http://www.ipni.org (5 January 2011). The Plant List. 2010. Version 1. http://www.theplantlist.org (22 June 2011). U.S. Census Bureau. 2009. American community survey demographic and housing estimates: 2005–2009. http://www.census.gov/acs (4 January 2011). USDA–NRCS [United States Department of Agriculture Natural Resources Conservation Service]. 2010. PLANTS Profiles. http://plants.usda.gov (15 September 2010).